The number one rated museum attraction in Hawaii by Trip Advisor, every vacation to Oahu should begin with a visit to Bishop Museum. Bishop Museum offers incredible displays and stories of Hawaiian culture and history, planetarium celestial shows, amazing traveling exhibits as well as unbelievable live lava demonstrations! Experiences for all ages with fun, interactive presentations, Bishop Museum tells the full story of Hawai‘i in relationship to its place in the Pacific and the world! Founded in 1889, Bishop Museum has several buildings that offer specific and distinct adventures for guests of all ages! Hawaiian Hall is the world’s premier showcase of Hawaiian history and culture, and serves as the heart of Bishop Museum. Today, Hawaiian Hall is listed on the National Register of Historic Places and is one of Hawai‘i’s most significant and iconic buildings. Pacific Hall explores the origins, culture, and values of Pacific people and the migrations and settlement of the Pacific Islands. . Visitors are able to see one of the world’s best collections of model canoes, as well as interactive experiences. Jhamandas Watumull Planetarium has played an important historical role in the advancement of ocean navigation. World-renowned Hawaiian Navigator Nainoa Thompson learned how to navigate using only the stars by training at the planetarium. Visitors can explore the skies of Hawai‘i and Polynesia in the ways the ancient travelers once did. The Planetarium allows visitors a full astronomy educational experience, making them feel like they are flying through the rings of Saturn, the depths of the ocean or to the summit of Mauna Kea. Planetarium pricing is an additional $2.95 per person, per show, available for purchase at the Bishop Museum Admission Desk. The Richard T. Mamiya Science Adventure Center is a 16,400-square-foot space of interactive exhibits and high-tech displays, offering fun and exciting learning opportunities focusing on science as it relates to Hawai‘i and Pacific environments. The center is very interactive, and a treat for the whole family! At the center: a giant volcano standing 26-feet-tall, modeled to look like Kīlauea’s active crater on Hawai‘i Island. Visitors can see and learn about lava and the formation of the Hawaiian Islands, with the help of a glow-in-the-dark lava tube, an interactive erupting volcano, and a lava melting show, moderated by a real Bishop Museum scientist! 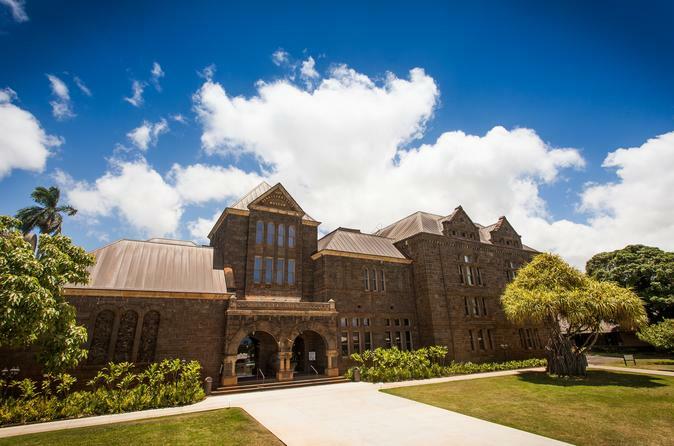 Castle Memorial Building showcases exhibits on loan with Bishop Museum for a limited time period. From life-size animatronic dinosaurs and sharks, wearable art to Dora the Explorer, this is the place for new, exciting exhibits and adventures!